The first time I heard of Rama Jama’s was during an Alabama football game. I don’t remember who Bama was playing that night, but in between commercials, they played a segment called Todd Blackledge’s “Taste of the Town”. 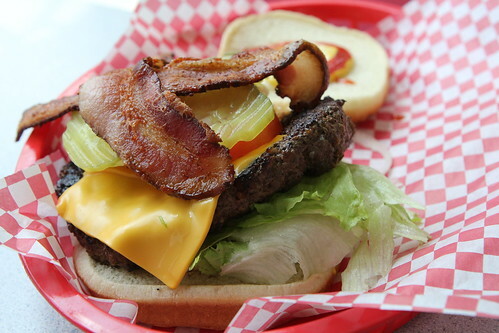 In that episode, Blackledge paid a visit to Rama Jama’s for a pretty fair looking burger. I don’t remember what happened during the game, but three years later, I still remember Rama Jama’s. Wanting to finally scratch Rama Jama’s off my to-try list, I pulled off I-20 and made my way to the little building under Bryant-Denney Stadium. When parking, I couldn’t help but notice the wall that sits in homage to both Alabama football and this small restaurant. 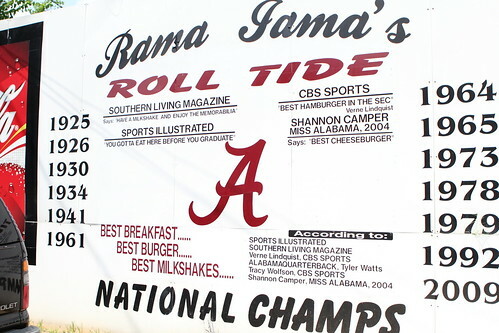 Listing both the dates of the, at the time, 13 national championships and a variety of endorsements for the restaurant, there’s little doubt that Rama Jama’s is proud of their product and their school. The school spirit continues inside as every square inch of wall space is devoted to Bama posters, newspaper clippings, magazine covers, etc. After doing my best to soak up all the Alabama history and memorabilia, it was time to see this cheeseburger that the CBS sports analysts, Verne Lundquist and Tracy Wolfson, had dubbed the best in the SEC. The National Champ Burger is Rama Jama’s take on the bacon double cheeseburger, although the second patty was conspicuously absent. From the first bite, I couldn’t see what the fuss was about. 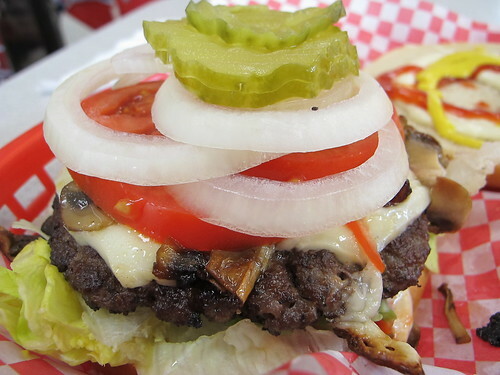 This burger features an overcooked, under seasoned patty that has no real beefy flavor. 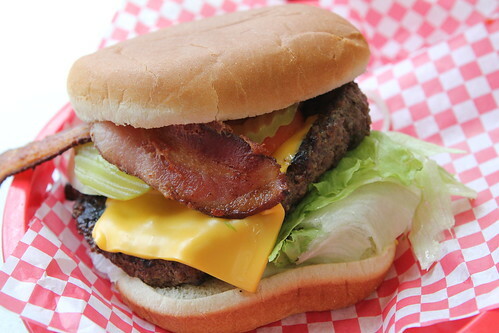 A few thick slices of bacon provide a little salinity and interest but this burger is best eaten covered by the small mountain of lettuce, onion, tomatoes, pickles, mustard and mayo. Maybe I would have better luck with a simple, chili dog. 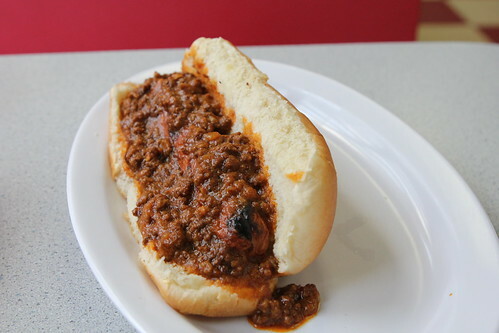 While better than the burger, this chili dog is nothing special. Little more than a grilled ball park frank with a helping of smoky chili, this chili dog gets the job done but without much fanfare. Not wanting to completely write off a Tuscaloosa institution, I was soon back at Rama Jama’s to see if my first visit had been a fluke. This meant diving headfirst into their menu with a Swiss and mushroom burger. Like the National Champ Burger, this patty arrived covered in plenty of toppings. Much like the first time, this burger was subpar at best. 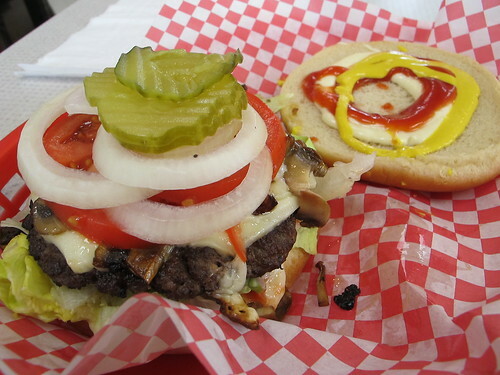 The mushrooms, mayo, and Swiss did make this a passable lunch but a properly cooked patty would have been preferable. Continuing the overcooked cavalcade at Rama Jama’s, the RJ’s dog was the second and final victim of the day. 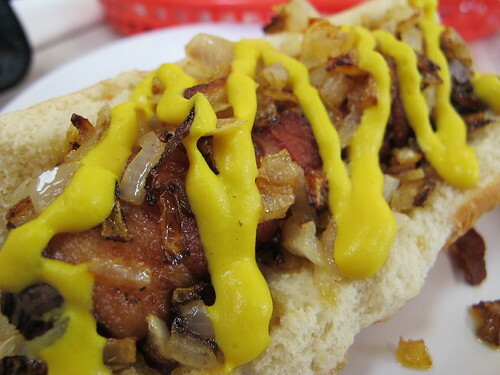 Bacon, mustard, and caramelized onions do their best to dress up the humble hotdog. Despite the too crispy bacon and mostly burnt onions, this was a pretty fair hot dog. 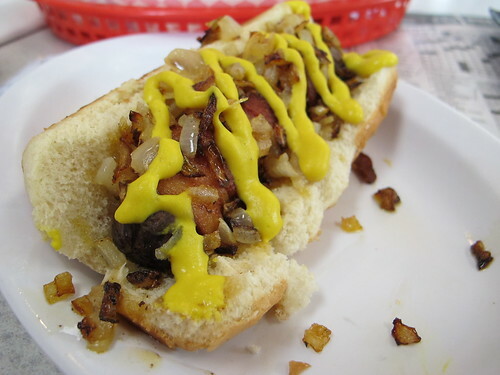 If anything, the RJ’s dog proved that bacon can only help a seemingly lost cause hot dog. From what I’ve read, outside of their cheeseburgers, Rama Jama’s is known for their hearty breakfasts. That very well may be the saving grace for this restaurant under the south end zone, but in my experience, Rama Jama’s is best for soaking up a little Alabama nostalgia. Bottom line, come for the memorabilia and maybe a milkshake but try somewhere else for lunch.